Looking to play online poker in UK or Ireland? If yes! Then please check out William Hill. 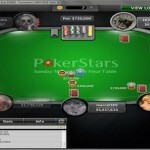 It is among the top poker portals operating legally in United Kingdom, Ireland and in European countries. You would find more than €5,000,000 of guaranteed prize tournament here at William Hill every month. They take their tournaments and players very seriously. Whether you like to play small or shorthanded cash games or looking to hang out with Turbo, DeepAtacks, Freezeout or Rebuy, William Hill is always there. You will have great opportunities to multiply your investments hundreds or thousands times, every month with the use of any game/tournament here on WH. The Sunday Line Up: – You know that Sunday is the day, when people enjoy their time with online poker. The Sunday Line up by William Hill brings enormous opportunity and offer 14 tournament with over €250,000 in guaranteed prizes. Some of them are Big Sunday (€75K GTD), Sunday Eclipse (€6K GTD), Sunday Frenzy (€7.5K GTD), Grand Sunday (€30K GTD), Sunday Phoenix (€12,500 GTD) and Sunday Warm Up (€25,000 GTD). Daily Classic:-This is one of its own kind series, which help you to boost your bankroll and improve your MTT’s skills. The buy in here is just €1 to €10. ECHO (Win your share of €5,000 GTD), Pure (Just €1 buy in), and Prime (get your share of €2,000)…. High Rollers: – The High Rollers are very important to mention. As The buy in ranges from Just €20 to €50, you can win massive guaranteed prizes up to €100,000. The Big Sunday of €100,000 guaranteed, the DUSK of €5,000 GTD and the Grand of €30,000 Guaranteed. Satellites: – You can get through to the main event using token satellites of €0.5 to €10 tournaments.